There’s a tradition at AVPN conferences that Doug Miller, founder of AVPN, leaps onto the stage. The challenge is that as the events expand his staff keep raising the height of the stage! 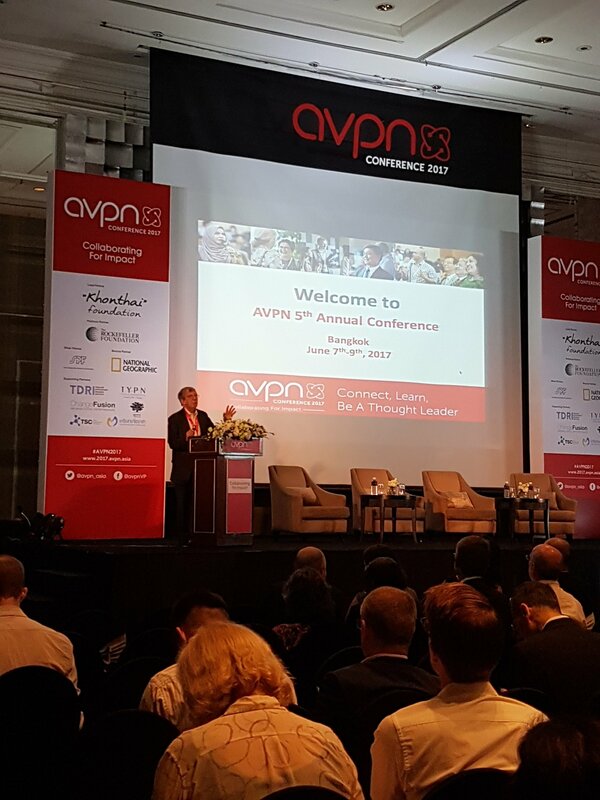 Now in his early 70s, you might think Doug would be wary of a stage leap but leap he did (and survived) and used the moment to make three great points that firmly sum up the efforts of the AVPN 2017 crew. 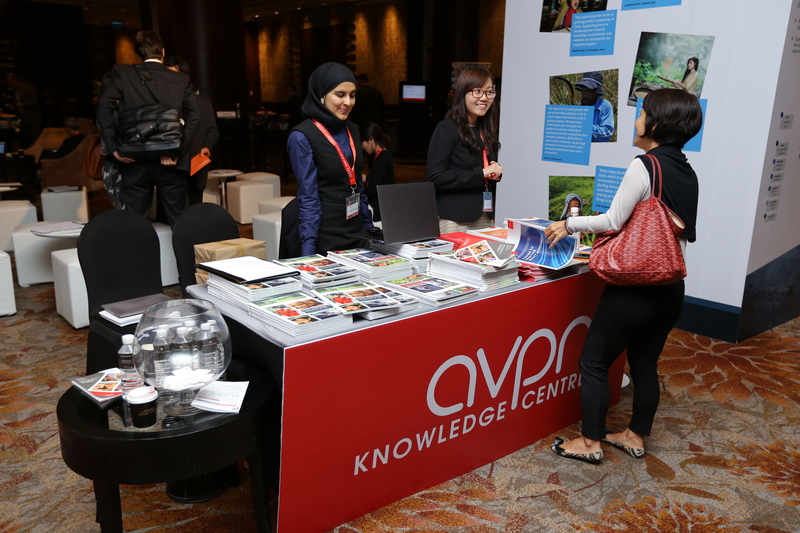 And so the AVPN team – despite only being 5 years old – took on the conference and made it their largest and most ambitious AVPN conference to date and pushed for the collaboration of sexes, nations, stakeholders, financing and ideas to tackle the multitude of development challenges across Asia. The stats themselves are impressive – over three days, the conference hosted over 700 attendees, with 119 speakers and over 5,000 connections made on the AVPN ‘connector’ – and are testament to both the regional desire to give back and AVPN’s ability to convene them and raise sponsorship for the event. Chairman of AVPN Doug Miller gives his welcome address. While it aims to have something for everyone with 44 official sessions (plus multiple fringe events) this does also mean that not everything is for everyone. However you really cannot get the breadth of content in other places, with sessions including ‘Leaping forward in technology for social good’, ‘Quality education for all’, ‘Collaborations & markets for more inclusive economies’, ‘The silver economy’, ‘The continuum of social investing’, ‘Bridging the funding gap’. And all of this with the perspectives from all four corners of the globe and from both major global & regional funders such as Rockefeller Foundation, Tata Trusts and Nippon Foundation though to multiple intermediaries, investors and practitioners plus new entrants in impact investing and multiple NGOs and social enterprises. The gender mix (equal men and women) and national representation (32 countries) was particularly noticeable with even majority female panels and with this diversity of talent and perspectives it gives you greater faith that the right talent is being engaged. Networking is an essential part of the event and there is considerable support and transparency for people to set up meetings in advance (AVPN Connector) and space to meet with these “friends and future friends” in and around the session rooms (the food was excellent too). Whilst mainly for funders and resource providers there is also a presence of non profits and social businesses who get to profile their work through the Deal Share platform and the funders I spoke to appreciate finding both investible organizations and also peers to relate to, often people who may be operating at a larger and leading scale. It is interesting to hear the diversity within stakeholder groups, with one foundation being amazed that their Chinese contacts hadn’t heard of grant making foundations until 3 years ago. (An example of the simple changes knowledge sharing can bring about). The overall takeaway is that there is a fantastic collection of talent looking at these challenges and we absolutely need to collaborate to reduce repetition of mistakes, have global insight adapted locally, build great networks between countries & stakeholders and ensure there is a progressive and suitable continuum of funding. I’m sure the AVPN conference will continue to not back away from a challenge, not fear failure and continue to go from strength to strength. JP Hamilton is the former Associate Director Strategic Philanthropy, Dasra.